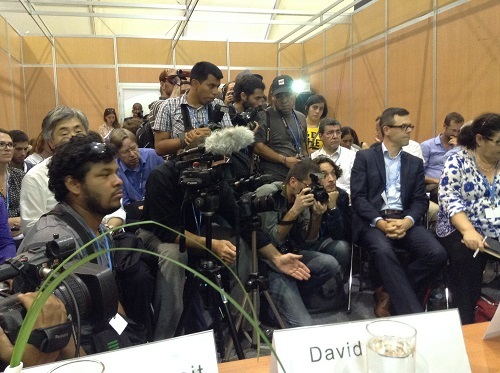 Wandering the COP20 campus, listening to side events and hearing senior political, business and NGO representatives talk about the climate issue results in a mild reality distortion field impairing your judgement; you start to feel sure that we must already be on a new energy pathway, that global carbon pricing is just around the corner and that the Paris deal will deliver something approaching 2°C. Then something happens to shatter that field and realisation sets in that there is still a long way to go before a truly robust approach to the climate issue emerges. On Tuesday evening the field was disturbed by tweets from a colleague at PWC @JG_climate reporting on negotiators squabbling over INDCs, with Brazil’s concentric differentiation approach causing some angst amongst a number of developed countries and the proposed text describing the nature of an INDC expanding by some thirty pages. This negotiation is far from over and the road ahead to Paris will likely be very bumpy. There will be a few dead-ends to watch out for as well. Another reality hit home on Monday afternoon with the recognition that many people in the civil society groups here in Lima just don’t want to hear about the reality of carbon capture and storage (CCS). The Global Carbon Capture and Storage Institute (GCCSI) held an excellent and well attended side event on Monday afternoon which was initially mobbed by some 100+ demonstrators and their press entourage. The demonstrators crowded into the modest sized room and the hallway outside, waited for the start of the event and then promptly left as Lord Stern opened the side event with his remarks on the need for a massive scale-up of CCS. Arriving and then departing en masse allowed them to tweet that civil society had walked out on Lord Stern. The demonstrators were equally upset that Shell was represented at the event with my presentation on yet another sobering reality; 2°C is most likely out of reach without the application of CCS; also a finding of the IPCC in their 5th Assessment Report. They also took exception to flyers for my book which carries the same message. What was really concerning about this walk-out was that the younger people who made up the group would rather protest than listen and learn. Had they stayed they would have heard a remarkable story by Mike Monea of SaskPower who talked about the very successful start-up of the world’s first commercial scale coal fired power plant operating with carbon capture, use (for EOR) and storage. This technology needs some form of carbon pricing structure for delivery and in the case of this project the bulk of it came from the sale of CO2 for EOR. There was also a capital grant from the government. Importantly, SaskPower noted that a future plant would be both cheaper to build (by some 30%) and less costly to operate. This potentially points the way to a technology that can deliver very low emission base load electricity at considerably lower CO2 prices than the ~$100+ per tonne of CO2 that current desktop studies point to. That may also mean CCS appearing without government support sooner rather than later. Of course, the actual construction and delivery of second generation projects will still be required to confirm this. A minor reality distortion arose from a question directed at me during the GCCSI side event. One audience member asked me about Shell’s membership of ALEC, a US organisation that operates a nonpartisan public-private partnership of America’s state legislators, members of the private sector and the general public. ALEC doesn’t seem to think that a carbon price should be implemented in the USA, hence the question to me given Shell support for carbon pricing. Responding to the Climate correctly reported on my response, which was along the lines of “. . that despite their position on climate issues we still placed a value on their ability to convene state legislators”, but DeSmogBlog had their own interpretation of this. They reported on this under a headline which stated “Company ‘Values’ Relationship with Climate-Denying ALEC”. It’s also proving a challenge to gain acceptance for the reality of markets and the role they are likely to have in disseminating a carbon price throughout the energy system. This means that carbon market thinking is still struggling to gain a foothold in text proposals for Paris, with one negotiator commenting at an event I attended that “we don’t see much call for markets at this time“. Silence on markets is the preferred strategy for some Parties, with others taking the view that specific mention and some direction is a must. More on this at another time as the Paris text develops further. The evenings in Lima have been filled with some excellent events. With so many people in town, dinner discussions are convened by the major organisations represented here, which results in great conversations, useful contacts and plenty of new ideas to think about. The Government of Peru have organised and run a very good COP, despite early concerns that there were initially no buildings on the site they chose for the event.